Everyone connected with the Louisiana History Museum is saddened that James Dale Genius, 77 of Alexandria, passed away on Saturday, November 19, 2016. In late 1979, he and his wife Claris decided to go into the antique business. They traveled all over the world and United States, maintained an online antique shop and were active in the national antique circuit until about 2004, when Dale accepted the position of Director of the Louisiana History Museum. 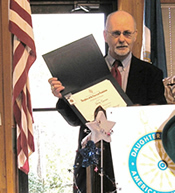 Upon accepting the director position, Dale's main interest was preserving the history of Alexandria, LA and the rich heritage of Central Louisiana. He devoted his life, especially the last 12 years, for our city and its fantastic history. Dale authored a history of Alexandria book, based on postcards of Alexandria's past, called What once Was, A postcard history of Alexandria, LA. He produced several DVD and TV programs on Central Louisiana historic buildings and Alexandria's history that are still running on cable channel 4 today. He established several websites, including one devoted to the history of the Hotel Bentley, and a website for the Louisiana History Museum. Dale appeared on the History Channel's Cajun Pawn Stars as an antique expert. He also wrote articles for the CENLA Focus for the past 4 years. His enthusiasm, dedication and rich knowledge of the history of Louisiana will be dearly missed. Dale Genius honored as "Central Louisiana Preservationist of the Year"
New Collection Entitled "Captain Mike Fisher of the Alexandria Police Department"
New Collection Entitled "Alexandria in Neon"
New in October 2014! The Louisiana History Museum announces release of a 2-volume DVD set featuring historic photographs of Alexandria and Central Louisiana dating from the 1850s to the 1960s. "Bells & Whistles" Collection - The LHM is proud to display artifacts donated by the Gamburgs. 80 photographs, part of the Museum's display at LSUA, are available for purchase. These would make an impressive display for an Alexandria business. All are 11" X 17" tabloid, some in color, some black & white. You can own a set of 40 for a $500 museum donation. Other options: we will rent them for special events, or loan them to a business in exchange for museum advertising. Contact the Museum for details. New! 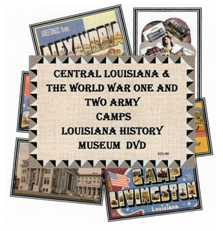 The Louisiana History Museum announces release of a 2nd DVD featuring a pictorial history of Central Louisiana. Includes over 30 minutes of vintage illustrations, many never before published, accompanied by 40-50s "Big Band" music.